A file system is a logical collection of files on a partition or disk. A partition is a container for information and can span an entire hard drive if desired. Your hard drive can have various partitions which usually contains only one file system, such as one file system housing the / file system or another containing the /home file system. One file system per partition allows for the logical maintenance and management of differing file systems. Everything in Unix is considered to be a file, including physical devices such as DVD-ROMs, USB devices, floppy drives, and so forth. 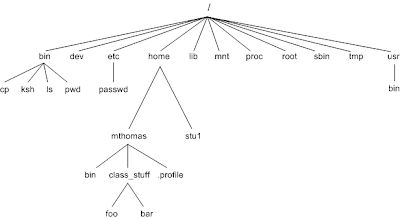 Unix uses a hierarchical file system structure, much like an upside-down tree, with root (/) at the base of the file system and all other directories spreading from there. It has a root directory (/) that contains other files and directories. Each file or directory is uniquely identified by its name, the directory in which it resides, and a unique identifier, typically called an inode. By convention, the root directory has an inode number of 2 and the lost+found directory has an inode number of 3. Inode numbers 0 and 1 are not used. File inode numbers can be seen by specifying the -i option to ls command. It is self contained. There are no dependencies between one filesystem and any other. 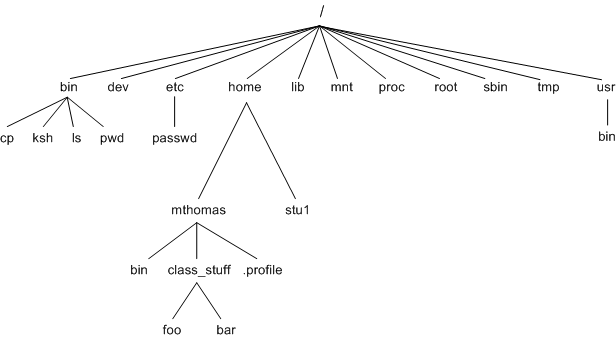 / This is the root directory which should contain only the directories needed at the top level of the file structure. /bin This is where the executable files are located. They are available to all user. /dev These are device drivers. /etc Supervisor directory commands, configuration files, disk configuration files, valid user lists, groups, ethernet, hosts, where to send critical messages. /lib Contains shared library files and sometimes other kernel-related files. /boot Contains files for booting the system. /home Contains the home directory for users and other accounts. /proc Contains all processes marked as a file by process number or other information that is dynamic to the system. /sbin Contains binary (executable) files, usually for system administration. For examplefdisk and ifconfig utlities. cat filename Displays a filename. cd dirname Moves you to the directory identified. cp file1 file2 Copies one file/directory to specified location. file filename Identifies the file type (binary, text, etc). find filename dir Finds a file/directory. head filename Shows the beginning of a file. less filename Browses through a file from end or beginning. ls dirname Shows the contents of the directory specified. mkdir dirname Creates the specified directory. more filename Browses through a file from beginning to end. mv file1 file2 Moves the location of or renames a file/directory. pwd Shows the current directory the user is in. rm filename Removes a file. rmdir dirname Removes a directory. tail filename Shows the end of a file. touch filename Creates a blank file or modifies an existing file.s attributes. whereis filename Shows the location of a file. which filename Shows the location of a file if it is in your PATH. You can use Manpage Help to check complete syntax for each command mentioned here. Some of the directories, such as /devices, shows 0 in the kbytes, used, and avail columns as well as 0% for capacity. These are special (or virtual) file systems, and although they reside on the disk under /, by themselves they do not take up disk space. Filesystem The physical file system name. kbytes Total kilobytes of space available on the storage medium. used Total kilobytes of space used (by files). avail Total kilobytes available for use. capacity Percentage of total space used by files. Mounted on What the file system is mounted on. You can use the -h (human readable) option to display the output in a format that shows the size in easier-to-understand notation. The du (disk usage) command enables you to specify directories to show disk space usage on a particular directory. This command is helpful if you want to determine how much space a particular directory is taking. Following command would display number of blocks consumed by each directory. A single block may take either 512 Bytes or 1 Kilo Byte depending on your system. This assumes that your CD-ROM device is called /dev/cdrom and that you want to mount it to /mnt/cdrom. Refer to the mount man page for more specific information or type mount -h at the command line for help information. After mounting, you can use the cd command to navigate the newly available file system through the mountpoint you just made. The mount command enables you to access your file systems, but on most modern Unix systems, the automount function makes this process invisible to the user and requires no intervention. User and group quotas provide the mechanisms by which the amount of space used by a single user or all users within a specific group can be limited to a value defined by the administrator. Soft Limit: If the user exceeds the limit defined, there is a grace period that allows the user to free up some space. Hard Limit: When the hard limit is reached, regardless of the grace period, no further files or blocks can be allocated. quota Displays disk usage and limits for a user of group. edquota This is a quota editor. Users or Groups quota can be edited using this command. setquota This is also a command line quota editor. quotaon This announces to the system that disk quotas should be enabled on one or more filesystems. quotaoff This announces to the system that disk quotas should be disabled off one or more filesystems. How to exit system console from HMC? How to reset "hscroot" password? Kernel 32 bit or 64 bit ? NEVER RUN THESE COMMANDS IN LINUX BOX CLI!